This quite modern 28-story building may be the best-looking of the few towers erected on Madison Avenue on the Upper East Side after World War II. 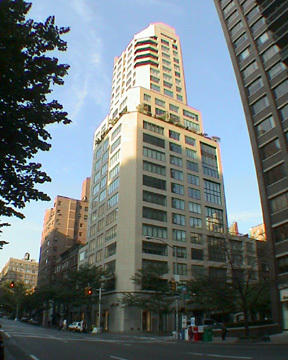 It was erected in 1987, thirteen years after the red-brick tower directly across the street at 40 East 80th Street and six years after the smaller tower at 1080 Madison Avenue just up the avenue across from P.S. 6. It was designed by Leibman Leibman Associates and developed by Alvin Dworman, Aaron Waxman, Shepard Forest and others. Like Citicorp Center, it has a rakish slant to its top, in this instance facing towards Central Park a park away to the west. One of its handsomest virtues is its limestone facade. While the truly elegant pre-war buildings were customarily clad totally in limestone, the eye-level' approach of recent decades assumed that pedestrians were too scared to raise their eyes off the ground. While this building may not conjure the white fantasies of the City Beautiful movement that was ushered in by the Great Chicago Exposition of 1893, it was a most welcome departure from the recent norm as well as an sincere and quite effective attempt to be modern, especially at a time when Post-Modern designs were flourishing. Furthermore, this "clean-cut" project has several double-height units facing the sidestreet, which is one of the city's nicest. Such double-height "studio" units are very rare on the Upper East Side. 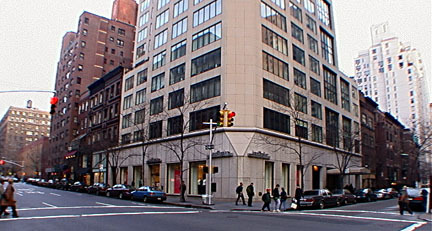 The building also features very large windows, excellent retail space, and a sitting ledge at its base, which is very attractive and unusual. Some of the units have whirlpool baths and bidets and all have intrusion alarms and TV security.